Crispy Fried Shrimp is a Cambodian Food Recipe for frying shrimp in breadcrumbs and serving with a sweet chili sauce. Boil shrimp for 30 seconds then drain. Beat the egg and pour over the shrimp, then set aside for 15 minutes. Mix up the breadcrumbs with salt and pepper to taste. 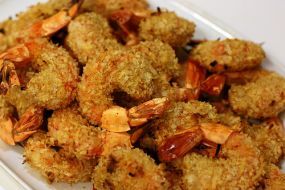 Place each shrimp individually into the pile of breadcrumbs and cover completely. Let the bread covered shrimp dry. Heat 1-2 inches of soy or peanut oil in a wok to 345°F. Put the shrimp into the oil 2 or 3 at a time, and move them around while they sizzle. The shrimp is cooked, so you only need to crisp the batter. Remove from oil. Let the shrimp cool slightly before eating. Serve with a bowl of sweet chili sauce.